Each year the RSPB hold a Big Garden Birdwatch to monitor the birds visiting gardens. Volunteers spend an hour watching their garden and record the birds that they see during the hour. I signed up for this years bird count (25 to 26 January 2014) before realising that it clashed with a busy weekend driving my children to four separate dance classes and rehearsals. When I realised I had such a busy weekend it was obvious it was going to be difficult to dedicate an hour to watching for birds when it was still light - so I looked for some technology to help. 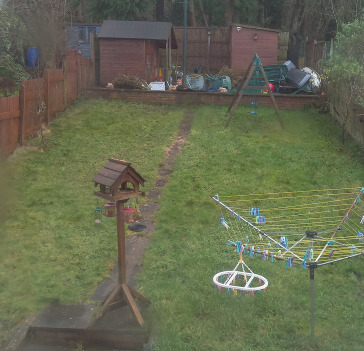 I connected up my Raspberry Pi and RPi camera to watch the garden so that I could watch for birds when I had spare time in the evening. I had a spare Raspberry Pi which I bought recently and borrowed the camera from my Raspberry Pi robot. 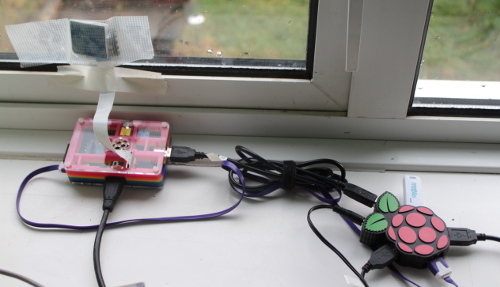 The camera was mounted on a Pimoroni RPi camera stand, which I taped to an upstairs window. As this was upstairs I needed to angle the camera down, which I achieved by arranging the mounting screws so that at the top they protruded out of the front at the top, but out of the rear at the bottom. The only other thing I needed to do was to move my bird table slightly. It's normally positioned to one side of the garden, but I moved it more centrally so that the whole of the bird table was visible. I added fresh seeds, peanuts and even some worms but no birds actually ate any of the food on the day. I used a 64GB USB flash drive to store the photos on, which I then transferred to my Linux laptop so that I could review them faster than the Raspberry Pi image viewer. Below is a sample photo (scaled down for the blog). The weather wasn't very good over the weekend and this was about the best quality with a few drops of water on the window. The weather did get worse during the hour, but the quality was still good enough to see for any feathery visitors. I then set raspistill program to capture one photo each second for an hour, using the timelapse mode. Raspberry Pi camera documentation (or run raspistill without any parameters for a summary list of options). 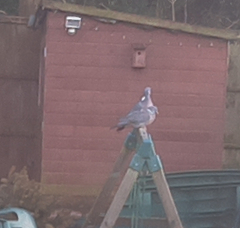 Nothing happened for the first 55 minutes, but then as the visibility was at it's worst these two woodpigeons visited my garden. They didn't go to the bird table, but landed on the children's swing a good way down the garden. These are a common visitor to our garden.